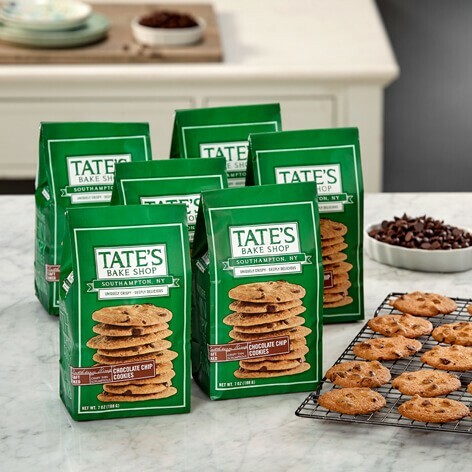 The one that started it all, our signature Tate's Chocolate Chip cookie is just as delicious as it was back when our bake shop first opened in Southampton, NY in 2000. Crisp, buttery, and unforgettable, you'll know with just one bite why these delectable treats were voted the #1 chocolate chip cookie in America. Yum! Want to create your own variety pack of cookie flavors? Call the Bake Shop Team at 631-257-5830 between 9 am and 5 pm EST. Fantastic! You have to try them! Best cookies ever! If you like crisp buttery cookies, you can't go wrong with these. Went through 6 bags in a couple days! Ordering more. The chocolate chip cookies are so good and the best for dunking in cold milk. I bought these at a local Speedway cause I was looking for a cookie to snack on. I was really surprised at how good they are. I love the butter flavor and how crisp they are. I have since found them in my local grocery store and stock up on them when they are on sale. The best store bought cookie I have ever had. These are the BEST cookies you will ever have! They are so buttery but crispy at the same time AND taste like homemade cookies someone’s grandmother makes. I live in Michigan and recently bought Tate's Chocolate Chip cookies at a local grocery store. Don't let my mother read this but Tate's are the BEST cookies I've ever had. I had to visit the website to see what else you had to offer. Some might be inclined to think the prices are a little high but these cookies are amazingly worth it. I can only imagine the other products are just as wonderful. Next on my list to try are the brownies!! Great cookie, crispy and full of classic buttery flavor. Crisp and full of flavor. When I get up to Southampton, Tate's will be my first stop ! I live in No. Virginia. Stepped into my local grocery store and saw a bag of Tate's cookies. I bought one bag, 4 days later I went back for more. 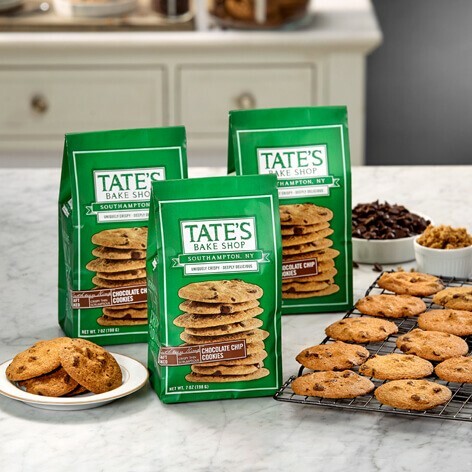 There is no other chocolate chip cookie that compares to Tate's !! Your cookies are absolutely , the BEST ! Thanks for the BEST !!!!! Omg I had these when they were Kathleen's! I was wondering what happened to them. Best cookies I ever had! I live in MN and bought a package of the gluten free chocolate chip cookies as well as the regular chocolate chip cookies and fell in love! A little pricey but worth every cent. I am not one to purchase store bought cookies, prefer to make my own. But I was hungry and needed a pick me up! The store I found these at is an upscale store and they carry unusual brands. I am so happy I discovered these delicious cookies! Warmed up in the microwave only makes them better. Yummy!!! Thank you for such a delicious cookie! These are the best cookies I've ever had. My favorite! First bite I knew I fell in love with Tates crispy cookies. Absolutely the best CC cookie I ever tasted.